This Place Known as Edgefield: Harris Bailey, Jr. describes the historical context of Edgefield where the stories of the four families are set. He examines the political, economic, social, intellectual, and cultural context of historic Edgefield. Finding My South Carolina Kin: Bernice Bennett's study resulted in a union with relatives she never knew, as well as the slaveholder's descendant of her 3rd great-grandfather and mother. A Journey to Find My Butler Ancestors: Ellen LeVonne Butler confirms her family's oral history passed down from her grandparents, and identifies the white families that enslaved them. The Journey Has Just Begun: Ethel Dailey vividly tells of her personal journey in researching her Edgefield ancestors. 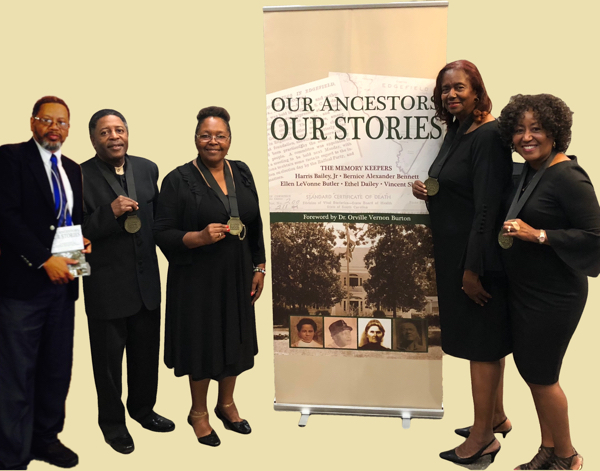 On Behalf of the Ancestral Spirits: Vincent Sheppard finds hundreds of maternal descendants of his great-great-grandfather's siblings as well as the offspring of his 3rd great-grandmother's twin sister. 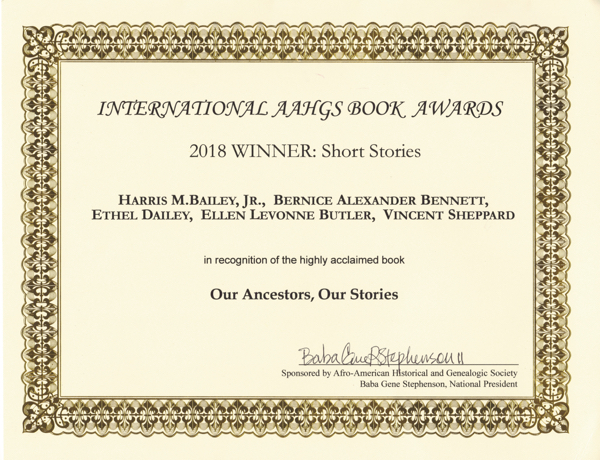 The authors of Our Ancestors, Our Stories – Harris M. Bailey, Jr., Bernice Alexander Bennett, Ethel Dailey, Ellen Levonne Butler and, Vincent Sheppard – received the 2018 International AAHGS Book Award for Non-Fiction Short Stories. 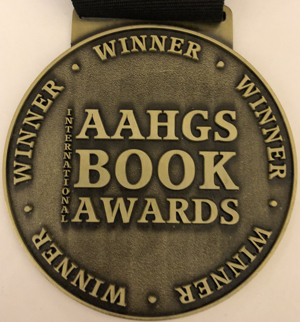 The AAHGS held its book awards ceremony on October 11, 2018 at the Valley Forge Casino and Resort Hotel in Philadelphia during its 39th National Genealogy Conference, October 11 – 13, 2018. Each author received a certificate and metal. The International AAHGS Book Awards (IABA) "is a competitive contest to recognize, promote and honor authors of high quality publications that accurately examine and portray African-ancestored family history and genealogy in a variety of genres both fiction and non-fiction, for adults and young readers."